From now on all my production projects for the Archive Film Series will be made using this camera, the oxberry and small developing tanks. The specification on this Fries/Mitchell 35R camera is unbelievable. The remote controller in the picture lets you program so many ways. It can shoot 1 – 120 FPS (all at crystal locked speeds), it can shoot single frame with programmed bursts with exposures in standard fractions or long exposures ranging from 1 to hundreds of seconds. It currently takes Nikon F Mount lenses, handy! It can shoot forwards and back always to exact frame count. You can programme runs with feet/meters or frames. The shutter does the usual 170 degrees to closed over range. Checking if it can be bi-packed. Also I got it running on 12VDC so I can take it into the field. My plan is to produce all my Archive series films for my research projects practical components with this camera and make positives with either the steenbeck contact printer or the Oxberry. Also for using existing (found and collected) positive footage I plan to copy to 35mm using an internegative stock, then print back down to 16mm via the oxberry where I will have a chance to make frame stops and permutations of frames and copies. etc. Having this degree of control over (mostly studio based) film ideas is a massive boost to the ambition and scope of ideas, especially the series based around bulk pass exposures. The camera is a little heavy and unwieldy. Not as much as you might think though. 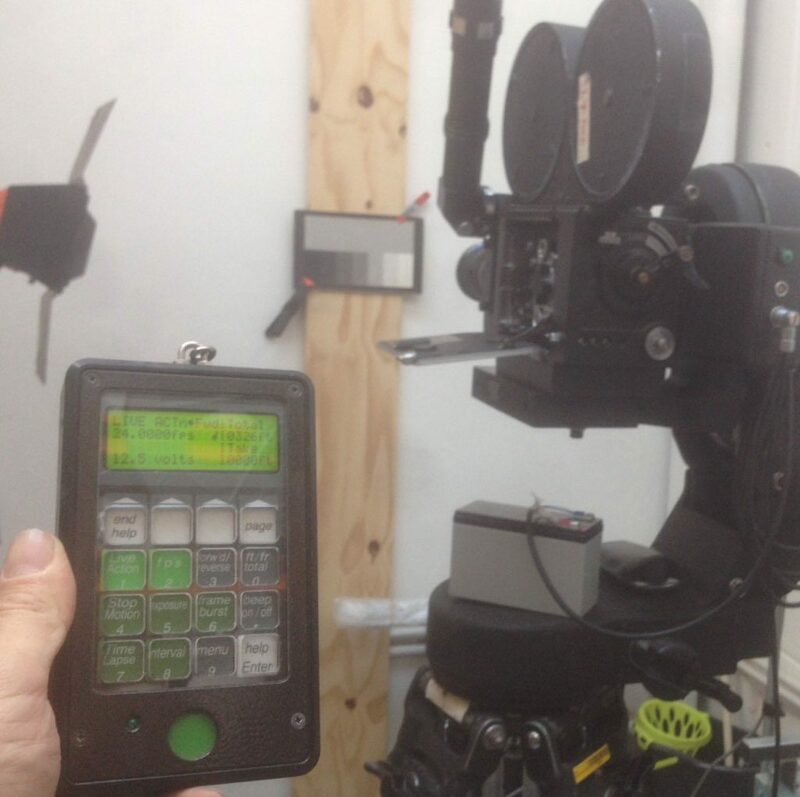 Thanks to Aardmans for lending me an airhead mo-co to let me mount it and pan-tilt in tiny increments. However a Mitchell geared head is really what I need when I take it outside. If anyone reading has got access to one of these and is happy to lend it please let me know. I am eternally indebted to the late Bolex Brothers animation studio for this acquisition.